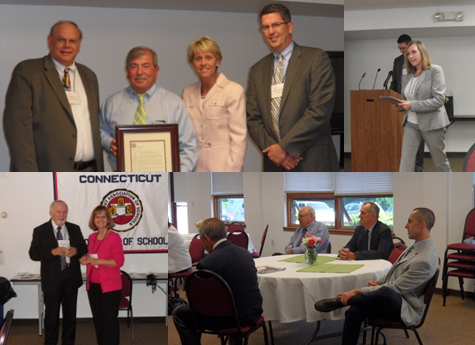 On May 29th, CAS hosted its 62nd annual meeting, but it was unlike any of the previous sixty-one annual meetings held to date! Historically, the spring membership meeting has been an event at which we conducted all of the business required by our Constitution – e.g., adoption of bylaw changes, budget, Nominating Committee Report, etc. Thanks to the wonders of technology, we can now handle all of that business electronically. However, we wanted to get our members together nonetheless, as a way of thanking them for their contributions to the association and to our challenging profession. So, we transformed our traditional business meeting into an end-of-the-year celebration and awards ceremony. • The Eligibility Review Board welcomes Sheila Williams from Platt Technical High School and Jennifer Straub from Maloney High School. The reception concluded with an awards ceremony honoring members who have made extraordinary and long-term contributions to the association. This year, four deserving individuals were selected to receive a CAS Letter of Commendation: Missy Bavaro-Grande, principal of East Granby Middle School; Karen Fitzsimmons, principal of Duffy Elementary School; Mike Pitruzzello, athletic director of Middletown High School; and, Rick Watson, principal of Griswold Middle School. Unfortunately, Karen and Rick were unable to be in attendance but will receive their award on a future occasion. CAS Assistant Executive Director Earle Bidwell presented CSDE Arts Education Consultant Scott Schuler with a plaque in honor of his many years of selfless dedication to promoting the arts in Connecticut. The video clip above offers a small glimpse of the myriad activities and events sponsored by CAS during the 2013-2014 year. In honor of the annual meeting, each division was asked to prepare an end-of-the-year report reflecting its highlights for the 2013-2014 year. Those reports are available at the links below.